I love to watch sports. And I like to read about my favourite athletes and look at the scores from the night before. But I don’t like to do it alone. For me, sports is something social and really much less enjoyable on my own. While my son, Matthew, is away at camp, the joy of sports is not there quite as much for me. I don’t live in a house with big sports fans. How did a big sports fan like me find one of the few males in Canada who doesn’t just dislike sports but basically resents them? I think David enjoys some of the snacking associated with viewing big sporting events, but that’s where it ends. I remember at our wedding, my brother said in his speech that he could see far into the future. He thought of the day that the Jays were back in the World Series or a certain Toronto hockey team dared make the Stanley Cup finals. I would be sitting on the couch with the guys and David would provide us with great snacks! My brother alluded to something key in his speech – sitting with a group enjoying the game. A social environment. It’s hard to watch baseball in the summer by myself. If I turn the Jays game on in the evening I feel the wrath of an angry toddler who gives me the evil eye and says one word to me, “Dora” She’s not interested in watching baseball with me. But sports is not just about watching the game in a social setting. It’s also about talking about it, for hours or sometimes days. You need someone to discuss that great play or missed called strike. When Kevin Pillar makes one of his incredible “Superman” catches it’s not enough to see it on my TV from all angles. I have to share my thoughts with someone else. There is a reason why Superbowl parties are so popular, and it’s not just because of the good food that is typically served. It’s about the social setting, of friends getting together to enjoy the event together. Even if you know nothing about football (how many downs was that?) you can’t help but be with the crowd and get excited by great plays. Your team may not have made the playoffs, but you have to watch that final game of the season with your best buddies. So while the baseball season is in full swing and the soccer World Cup is about to reach its crescendo, I am feeling a bit of sports withdrawal. Is it sad that I’m a bit lonely? I’m not a bar or pub-loving type, so that’s out. But hey, there’s a reason why Toronto bars are packed in the morning lately as patrons catch a World Cup playoff match and of course want to do so in a social setting (or maybe they don’t have cable and it’s the only way to watch the game). People come together over sports. Strangers stand side by side and cheer together for their team. Huge crowds packed Maple Leaf Square and Jurassic Park in downtown Toronto when the Leafs and Raptors were on their short playoff runs. Sports is inherently social, and I like it that way. How many more days until Matthew returns from camp? If you are a sports fan, May is a great time of year. There is a plethora of choices of sports to watch, read about, follow and discuss. If you want playoff action, there’s a hockey or basketball game every night. Baseball is in full swing. Soccer has come alive. There is a game on my TV every night, and I will admit, once in a while I fall asleep during the height of the action. A few nights ago, I watched a Toronto Raptors’ game with my eyes closed. I was too tired to watch, so instead I just listened. The sounds of the game fascinated me. Have you ever closed your eyes and just listened to the game? And I mean really just sat down, relaxed and listened? The radio works, but I find the subtle and nuanced sounds the television cameras pick up are even more fascinating. I also like the even tempo of the bouncing ball as a player races down the court. My son loves when a ball slides through the net with a perfect swish sound. The sounds of the ballpark. These are special. I went to a Blue Jays game last week, and at one point I closed my eyes so I could take in all the sounds around me. Even if you aren’t paying attention to the action on the field, there’s nothing like the concession vendors who run up and down the aisles yelling, “Beer here, ice cold beer” or “Popcorn, peanuts and Crackerjacks!” On the field there’s the sound of the bat as it makes contact with the ball or the sound of the ball hitting the catcher’s mitt when the player swings and misses. And the umpires. Some of them articulate the word “strike” so well that you can hear it for miles. Just listen to the crack of the bat and cheers of the crowd in this example. You know it’s a baseball game in an instant. No matter the sport, each brings its own unique sounds. The grunt of the athlete and ball hitting the racquet in tennis. The calls of the quarterback in football. Oh, how I love the sound I hear when skis turn on the snow. How about the swing of the golf club and the sound when it hits the ball? What are you favourite sports sounds? Post a comment here or on Facebook or Tweet me @AliciaRichler. I would not consider myself an athlete. 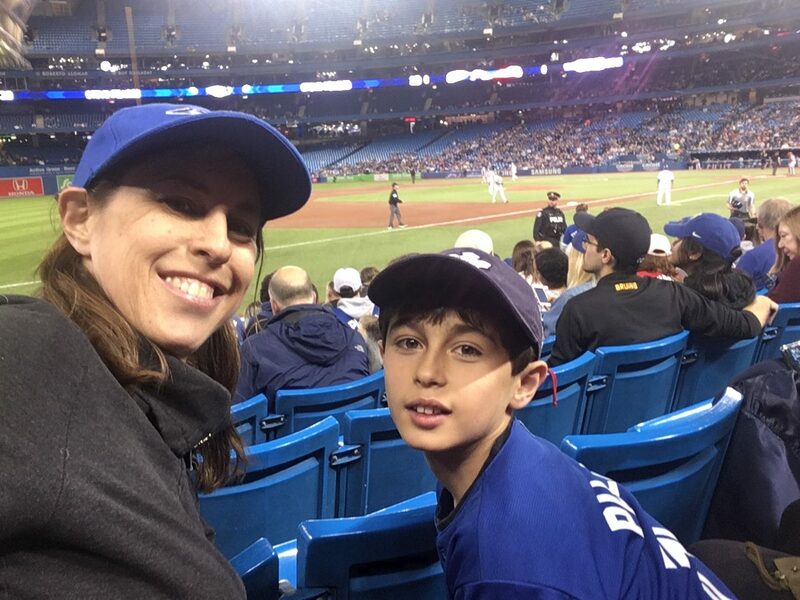 When asked if I play sports like baseball or hockey, my answer is often, “those who don’t play, watch.” I like to watch sports and love to talk about them, especially with my son. But not always. There is one sport in which I actively participate: downhill skiing. My parents first put me on a pair of skis when I was four years old. I don’t actually remember what it felt like that first time as I was so young. 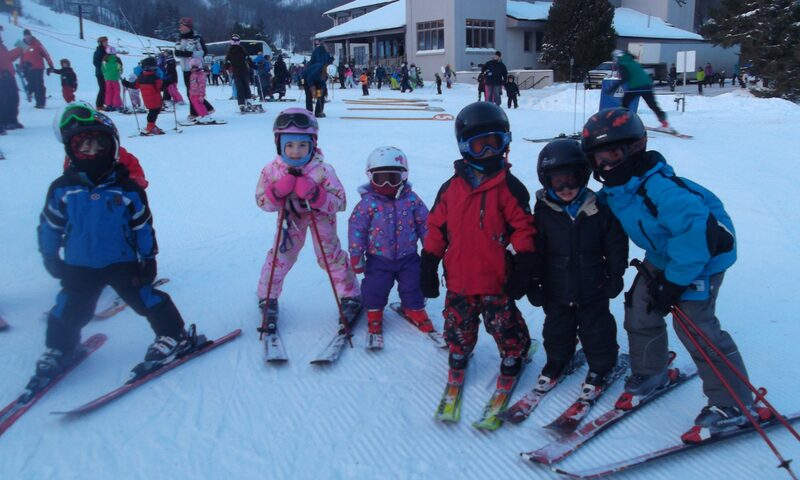 It was a time before young children learned about “pizza’ and “french fries” on the ski hill. I learned the basics of snow plow and found my way down. 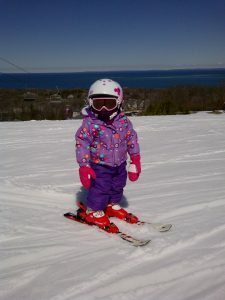 Our family skied at various places in Ontario and Quebec. 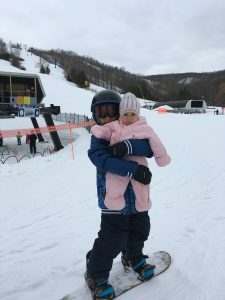 Well-known Laurentian hills like Mont Tremblant, Mont Saint Saveur and Morin Heights gave me my first early exposure to good quality skiing conditions. 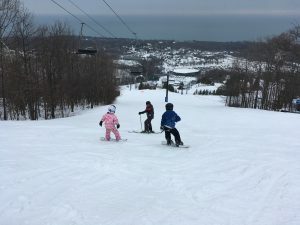 I took lessons at a small place in Ontario called Devil’s Elbow, and sometimes we ventured further to places like Blue Mountain, and more recently, to Alpine Ski Club. Note that I keep using the word “we.” That’s important. 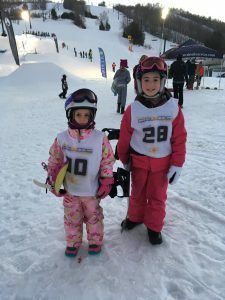 Skiing was a sport my whole family did together – my parents, brother and sister too (she was on skis before she was even three!). 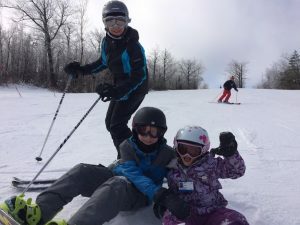 No matter how busy we were all week, in the winter our family jumped in the car on a Saturday morning (or during a winter vacation) and headed to the ski hill. It was our break from life and a chance to spend quality time together. Think about all the sports in which you participate or watch. How many of them can a family all do together, as one unit? Or even if a family can, do they? Skiing is one of those. 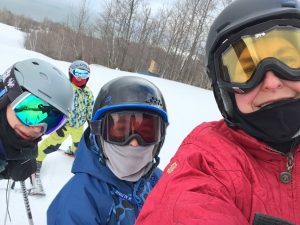 I felt privileged as a child and even more so now as an adult, to be able to ski every winter weekend with my family. I think we take too many selfies on the hill. Cousins testing out the ski hill at night, for some railing fun. And when I say my family – I mean my parents, my siblings and their families and my husband and children too. It’s a rite of passage in our family. 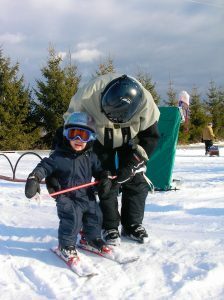 A baby learns to walk, then run, then ski. And the diaper is still on! 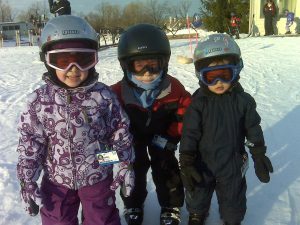 Matthew, in blue, on skis for the first time at age 2, with his big cousins. 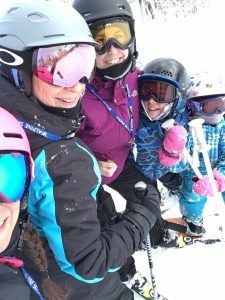 As any ski family will agree, getting ready to go skiing in the morning, in a house with piles of children (more on our family country home another day) can be a rather unpleasant and sometimes downright horrible experience. At the height of the season we are 16 people in the house – an even 8 adults and 8 children. The children range in age from one to fifteen. And no one cooperates. Someone is always crying or screaming or fighting with a sibling. Socks are lost. The previous day’s long under wear wasn’t washed because a child forgot to put it in the laundry. A glove was left at the ski hill the day before and a tantrum ensues. 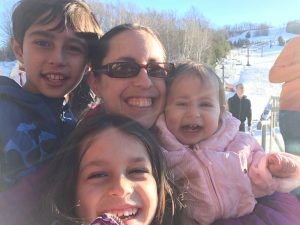 We rush to the car, zoom to the hill and deal with the next level of craziness: get the kids out, strap their skis and snowboards to their feet and throw them on the hill. Someone is usually crying, screaming or fighting yet again. Is it all worth it? Once I am at the top of the mountain and look down at the sparkling white snow ahead of me all my stress disappears. I can let go. I am free. All the craziness of the week, my career and my family melt away. I let my skis take me down the hill. Yes, it is all worth it. The view I love. 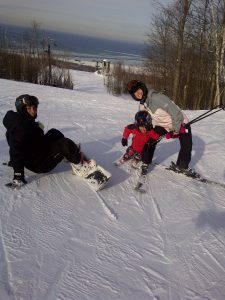 That’s Julia, my father and Matthew sliding down the hill together last year. There’s always a fun mix of family on the hill, like my mother, nephew and daughter. It’s about minus 15 outside today, and I am in the city and unable to go skiing. But tomorrow, well that’s another story. It may be cold outside (okay, it is insanely freezing), but I will be out there on the ski hill doing my thing. As will my parents, siblings their kids, my kids and maybe even my husband (okay, not the baby, she will be in the daycare). And I will be skiing every weekend this winter. If you need to find me, look for me on the hill. We all want our team to win. It can be heartbreaking when they lose. Wouldn’t it be great if the Blue Jays went 162-0 in 2018? Imagine if the Raptors won all 82 games they played? Okay, that’s not going to happen, but we all want our team to win as many games as possible. Your team will lose sometimes. But it’s just pathetic when your team loses badly, by many runs, points or goals. That happened to my team yesterday. I love the Carolina Hurricanes. I have a personal connection with this team going back to the early days in my career, and I always want them to win. They went all the way in 2006, but winning has been a bit of a challenge for this team since then. So the Hurricanes lose more often than they win over the last few years (though they do still have a winning record this season). I don’t like that, but I have accepted it. When they lose 4-2 or 2-1 or even 3-0 it’s rough. But they lost to the Toronto Maple Leafs yesterday by a score of 8-1. The Canes were down 2-0 with less than six minutes played in the game. And by the end of the first period the hole was even deeper, down 4-1. And this wasn’t just any game. They played the Maple Leafs, in Toronto, on the 100th anniversary of this storied Canadian hockey franchise. As the disastrous third period unfolded (two goals scored six seconds apart, really?! ), I tried to remind my Leaf-loving son that at least MY team won the Stanley Cup this century and not 50 years ago. He shrugged it off and laughed, as the Leafs scored yet again. When your team loses that badly it’s just embarrassing. You try to find something positive in the game, and you come up empty. All I could think of was that at least the Hurricanes weren’t shut out. Isn’t an 8-1 loss so much better than an 8-0 loss? I tried to explain this after the game to my Leaf-loving son who ran around the house in celebration, both of the massive win and 100th anniversary of his beloved team. He laughed at me again. He doesn’t know about the many long, sad years when Leaf fans saw their team lose again and again. But I wasn’t a fan of the Leafs. I was – and am – a fan of the Carolina Hurricanes. Okay, so my team lost, big time. But they will recover, and they will get ‘em next time. Go Canes Go! 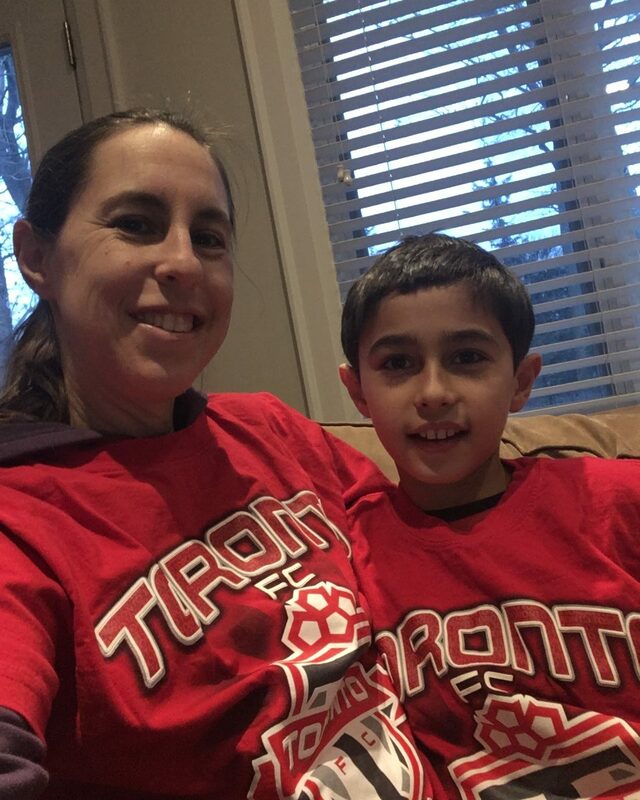 Matthew and I are fans of the Mighty Toronto FC, our local Major League Soccer (MLS) club that won the big championship this past weekend. Unlike the bandwagon we joined when the Toronto Argonauts won the Grey Cup a couple of weeks ago, we are the real thing. Well, kind of. Soccer, or as the rest of the world (except Canada and the United States) calls it, football (no, not the NFL or CFL), is a sport I have always enjoyed. Okay, when I say enjoyed, I mean to say that I enjoy watching. I’m not much of a soccer player. It’s not in my top group of sports that I follow, like baseball, hockey and basketball, but I like it. I remember when Toronto FC joined the MLS back in 2007, and wow, they were bad. But aren’t expansion teams supposed to be terrible? I watched the odd game and kind of followed them during that first season, and I monitored the team’s progress over the following years as their record steadily improved. I think my story is quite similar to many others across North America who follow MLS. You won’t find millions of diehard soccer fans across the US and Canada like you may see in Europe or South America. But the MLS fans are loyal. They love soccer and they love their local team. 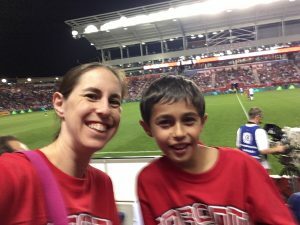 Toronto FC fans are great, and I want to send a shout-out to all of you who have been watching the games on TV and going to the matches over the past 10 years. Soccer is an exciting sport to watch, and there is always tremendous athleticism on display. Fans are always treated to a great show. And this year’s Toronto FC team was something special. This incredible group of athletes broke so many MLS records. The team finished the season with 69 points, which was of course a new league record. It also won a special soccer triple crown: the 2017 Canadian Championship, the Supporters’ Shield and of course the MLS Cup this past weekend. This team is the perfect example of a true champion. And Matthew and I have been following Toronto FC’s rise to become league champions for a couple of years. We watched the disappointing loss in the league championship game last year, when it all came down to a shoot-out. Wow do I hate shoot-outs (that’s for another day). How can a 90-minute, hard-fought match come down to a few free kicks on a goalie? Really? But I digress. We knew early on that this season was THE ONE. This team was almost unbeatable, and it was like magic on grass every time they played. 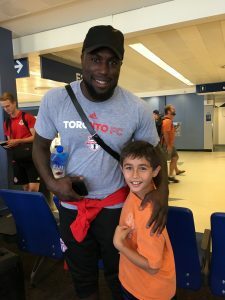 I knew who my favourite player was – of course, Jozy Altidore, who dons the jersey with the big number 17 on the back. Matthew agreed with me, of course! We even had the opportunity, in amazing seats, to see our team play – and win – in Chicago this summer. While we did not receive a warm welcome at Toyota Park from the local Chicago Fire fans, we didn’t care. Our team won! On that day in August we knew we were hooked. And we knew that Toronto FC could go all the way. Of course we had to take a selfie from our seats at Toyota Park this summer. And oh they did. With grace and style. This is a team to remember and to celebrate. We watched every minute of the championship game on Saturday and sat on the edge of our seats as Toronto FC dominated early on. And then MY player, Mr. Jozy Altidore, scored the big goal. And we knew they could do it. Congratulations to Toronto FC. And congratulations to the loyal fans. Let the celebrations continue. There’s Doping at the Olympics. Really? Were you as shocked as I was yesterday when the International Olympic Committee (IOC) publicly admitted that there’s a doping problem in Russia? Didn’t you always think, like I did, that the Olympics are where clean and honest sport comes together in a show of strength and fair play? Now I know the truth: there’s doping at the Olympics. Really? My apologies for my rather sarcastic comments above. Honestly, I am not surprised at all by yesterday’s announcement from the IOC that Russia has been banned from the 2018 winter games in Pyeongchang, South Korea. It’s not because a few Russian athletes were found guilty of doping. Doping is a state-run industry in Russia, and after years of investigation the hammer has finally come down. 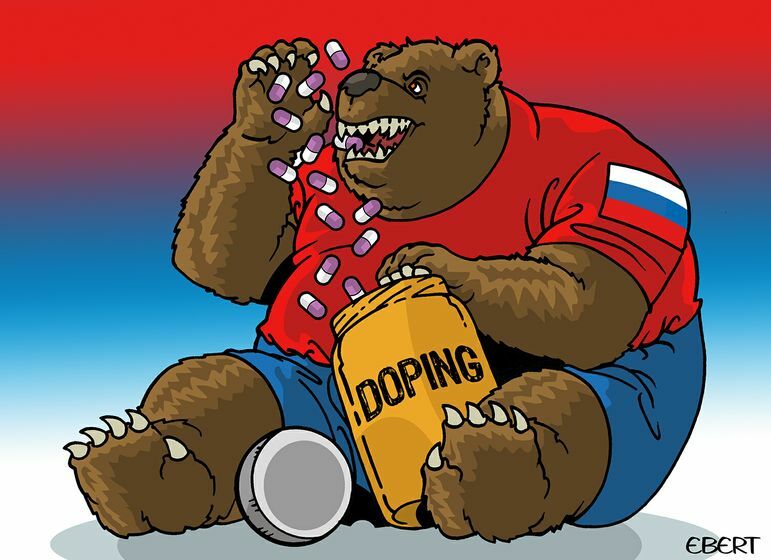 I have been reading stories about just how deep doping is entrenched in Russian sport. There is some sick desire to always win. Young athletes must be living in a culture where they are forced to break the rules and destroy their bodies just to be number one. It saddens me to know that there are probably hundreds, maybe thousands, of talented young Russian athletes whose dreams have just been crushed. Do 16-year-old skaters and 21-year-old skiers deserve to be thrown out of the Olympics before they even have a chance to compete? Did these athletes scheme and plan behind the scenes so they can stand on the podium in February? I doubt it. Unfortunately, they are part of a very broken system that demands cheating in order to win. And the IOC made it clear this must stop. Doping is unacceptable, ever. It’s terrible that hundreds of young, hard-working, talented Russian athletes will not be allowed to compete at the Olympics in a few months. They are caught in what may seem like an unfair system. But the IOC had no choice. The Russian Olympic Committee didn’t just break the rules for years, it laughed at them and stomped on them. I am intrigued by the IOC’s attempt to reach out to individual athletes from Russia, to separate individuals from their country that sponsors doping. I see this as a message to these young athletes, in particular those who have managed to stay out of the doping controversy (dare I say, are verifiably clean?) that they are welcome at the 2018 Winter Olympics. If these individuals qualify to compete (based on criteria outlined by the IOC), they are welcome, but not as Russians. These athletes won’t see a Russian flag and they won’t hear the Russian anthem. They will participate as athletes who do not represent any country. But if they agree to these rules and compete using only their abilities and relying on hard work, then I believe they will be warmly accepted by the Olympic community. IOC President Thomas Bach said it well yesterday, when he noted that the long-time Russian doping represented an “unprecedented attack on the integrity of the Olympic Games.” So, I hope that integrity returns to the Olympics. This is just a start. I love sports and have a particular interest in baseball. I do enjoy watching other professional sports, especially with my son, such as hockey, basketball and soccer. But I will admit that I don’t know much about football. Whether it is the CFL or NFL, with their different rules and nuances, I just don’t get it. I don’t watch football games. But I do watch the championship game each year. I guess that makes me a bandwagon Grey Cup fan. Over the years, numerous people have tried their best to explain football to me. In particular, I want to give credit to the amazing group of people I worked with at Rogers Sportsnet almost 15 years ago. They tried their best to explain downs to me. I learned about fumbles, touchdowns, field goals and so much more. I will admit that I did not internalize much of it. Maybe I just didn’t understand football. But you don’t have to know anything about football or even be a big fan of the game to enjoy the Grey Cup, the annual Canadian Football League championship game. Watching a bunch of grown men run back and forth on a frozen field, in minus ten temperatures and snow falling sideways, is entertaining. I don’t think I have ever actually watched a Grey Cup game in its entirety. I always watch the team introductions, coin toss and national anthem. Usually I watch the first half on and off, and I do enjoy the half-time show. But my attention usually drops off after that. The game just keeps going, and the clock keeps stopping. This year my interest was piqued a bit more than usual as I joined the bandwagon in Toronto and cheered on the mighty Argonauts. I’m not always a homer (Go Canes Go! ), but for the most part I support Toronto teams. And how could you not love the underdog Argos? Yes, I only watched the first half. It was a busy Sunday night in our house and there was no way I could continue to watch the whole game. I wasn’t in the group of people who gave up on the Argos early on and walked away. I believed in them and their abilities but just didn’t have a chance to watch. But I’m glad they won the Grey Cup! From what I saw of the game, my favourite part, which was so Canadian, was the singing of our national anthem. It was so creative. You just have to watch it. Another great part, you have to figure, was when the Argos kicked the field goal and won the game 27-24. They were behind the whole time and came through in the final minutes to win it all. Thanks to the internet I learned about the new Grey Cup champions via an alert while I put the baby to bed. So the CFL season is over. The NFL season is in full swing, and I really have no idea who’s been winning and who has been tanking. But like the Grey Cup, I will turn on my TV and watch the Superbowl on February 4th. Or at least I will watch some of it. And I will cheer on the winning team. That’s what a good bandwagon football fan should do. I want my team to win. I always want my team to win. Why is it MY team? Am I part owner? No. Do I work for my team? No. Did my spouse, father, brother, cousin, friend or next door neighbour ever play for my team? Definitely not. But as I watch my team play, I sit on the edge of my seat and have that feeling deep within that my team must win. For many people sports is a religion. For some people their passion for a sport crosses political boundaries. Their love of not only a particular game but of their team is true fanaticism. Go to any live sporting event between two teams, and the fans for each team are quite clear. Some people wear a cap or jersey, while other people paint their bodies and dress head to toe in the team’s colours. Popular or legendary sports franchises like the New York Yankees, Toronto Maple Leafs, Manchester United, Dallas Cowboys or LA Lakers probably make more money off the sale of merchandise than they do from ticket sales. I will admit that for the most part I am a homer. Carolina Hurricanes aside (yes they are clearly my team), I am a fan of the hometown team. I love my Blue Jays and Raptors. I have a Toronto FC shirt and you can bet I’m cheering on the Argonauts during this year’s playoff run. Okay, I even tolerate the Maple Leafs. Maybe it’s pride for my city or a warm feeling I have that I am part of a community when I cheer on the local sports franchise. I cheer on my team whether it’s the best team in the league or one of the basement dwellers. I stick with my team through thick and thin. Each game, if my team is down by 7 runs or 23 points, in my head I say to myself, my team must win. A true sports fan isn’t always straight in the head. As long as there are only two outs in the inning or a few seconds left in the period, the dream stays alive that my team can win. And sometimes it happens. If you are a Blue Jays fan, you will remember Sunday, July 30th, 2017. The Jays were down 10-4 going into the bottom of the 9th. They quickly scored a few runs then Steve Pearce came to the plate with the bases loaded and his team down 10-7. And he hit a grand slam. 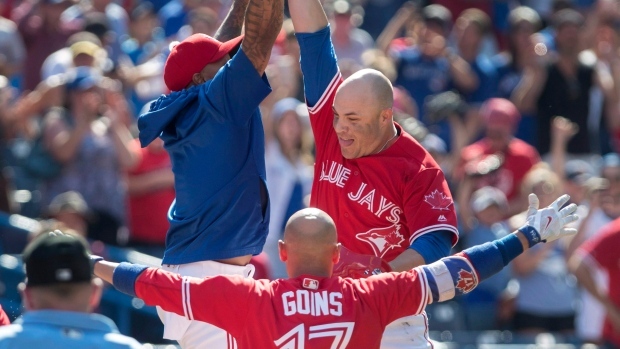 The Jays beat the Angels 11-10, and that win became the biggest 9th inning comeback in the team’s history. For a fan like me, who watched it all unfold, the words running through my head, my team must win, came true. My son, Matthew, was the inspiration for today’s post while he squealed with delight after his beloved Maple Leafs beat the Boston Bruins this past weekend in overtime. JVR scored the tying goal with one minute left in the third period. Then Marleau scored the winning goal for the Leafs in overtime. Matthew focused all his energy on ensuring his team would win. And they did. A sports fan will never change. If you love your team, you love that team with all your heart. I think that’s great. Sports fans, please never change. Last night was a great night, and I mean a really great night. Why? 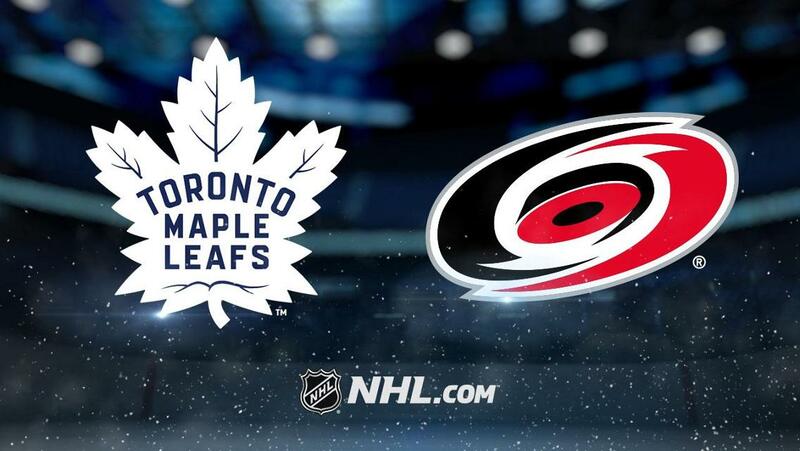 It’s because not only did the Carolina Hurricanes play the Maple Leafs in Toronto, but they beat the Maple Leafs in Toronto. And my Hurricanes didn’t just win, they won handily, 6-3. This brings me great joy. It’s been a busy week and I did not have a chance to write a post on Sports Wednesday. I had intended to write about my annual World Series fever, but that will have to wait until next Wednesday. So instead there is a special Sports Friday post as I revel in the Hurricanes win over the Leafs. As I wrote about back in June, I have been a Hurricanes fan since 2001. During the 2001-2002 season the team made it as far as the Stanley Cup Final only to lose to the Detroit Red Wings in 5 games. It just wasn’t their time yet. But I learned what a first-class organization the Hurricanes were and became a fan for life. The following season I was laughed at. People made fun of me. They heckled me as I kept my promise to be a big fan, even when the Hurricanes finished in the basement. They fought their way back, and my excitement culminated in June 2006 when they won the Stanley Cup. But I have to say that one of the highs for me goes back to the Hurricanes’ amazing 2002 playoff run during the series against the Toronto Maple Leafs. I proudly cheered on my Canes, when I watched the game at home with friends or in very public spaces. One of my friends who was – and still is – a Maple Leafs super fan – made fun of me and dared me to keep cheering on the “enemy” in the middle of Toronto. Who won that series? The Hurricanes. My teams has had its ups and downs since the famous 2005-2006 season, but I have always been loyal. I tried so hard to convince my son Matthew to follow in my footsteps and be a Hurricanes fan, but he refuses. 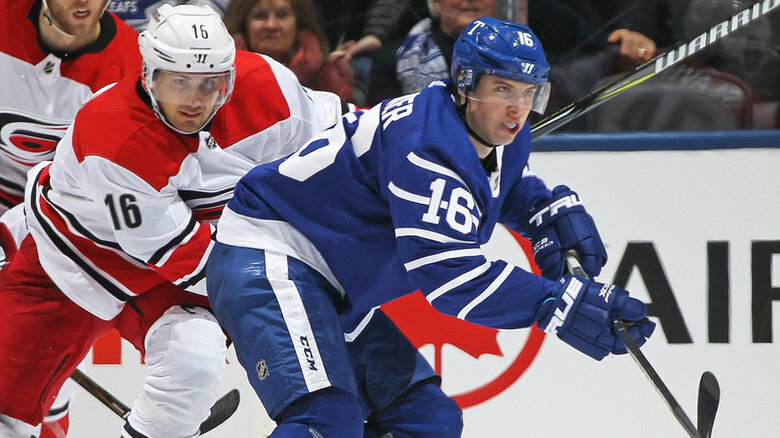 This Toronto boy has joined Leaf Nation, with all the disappointment that goes with it. So, when the Hurricanes come to town it’s always a ruckus and wild night in our house. I loudly cheer on my team and Matthew tries his best to make me be quiet. That was impossible last night, as my team went up by a score of 2-0 less than three minutes into the first period. It just got better from there, ending in the big win, 6-3 over the Leafs. Great game. Even the Leafs coach, Mike Babcock agreed, when he stated about the Canes at his post-game press conference, “They deserved to win. We didn’t deserve to win.” You got it, Mike. I love when the Hurricanes win, especially in Toronto. Yesterday’s blog on my pride about being left handed energized me, so I had to do a second post on the topic. But it’s Sports Wednesday today, so how could I connect the two? I turned on the Cubs-Dodgers playoff baseball game last night, and as I watched the Cubs first baseman, Anthony Rizzo, make a play, it occurred to me. 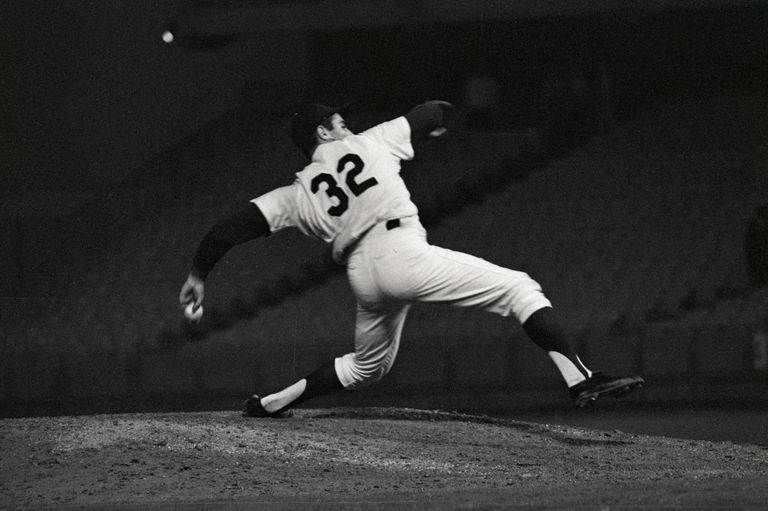 If you want a faster track to the most elite level of many professional sports, you just need to be left handed. You see, Anthony Rizzo is left handed. So is the Blue Jays first baseman, Justin Smoak. In fact, one-third of first basemen in Major League Baseball are left handed. Remember, we only represent 10 percent of the population. And the real gems in all of baseball are the southpaws, or left handed pitchers. I am not going to go into the technical details of facing a left or right handed batter and the various pitches that a lefty or righty may specialize in. I am just going to do some basic math. As I have discussed already, only 10% of the population is left handed, but every baseball team desires a few lefties, on their pitching staff, often at first base and other positions on the team. So a left handed person simply has less competition amongst the general population to make such team. My son, Matthew, often comments on this, and he is dumb-founded that his two left handed parents couldn’t have made him a lefty. My baseball-loving son tells me he is determined to make the major leagues one day, and he feels it will be harder because he is right handed. The left handed advantage is not just some crack pot theory of mine – there is scientific evidence backing me up! Some of the most memorable lefties in basketball include Bill Russell, Toni Kukoc, Lamar Odom, Isaiah Thomas, CJ Miles, Nick Van Exel, among others. In hockey, a left handed slap shot really is a beautiful thing. Some left handed hockey greats include Cam Neely, Phil Esposito, Roman Turek, Terry Sawchuk and Tom Barrasso. But I have also now learned, from an interesting New York Times article, that as many as 60% of Canadian hockey players shoot left handed, no matter which is that person’s dominant hand. Maybe they just know that left is best. Maybe after two straight days of reading my musings you all now know that left IS best. 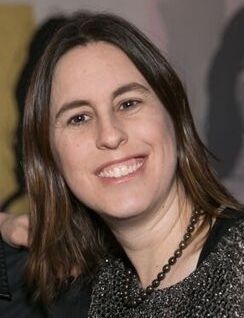 Hello, I'm Alicia, and thanks for visiting. Kinetic energy is the energy of motion. Life is busy, and we always seem to be in motion. Here you can rest for a few moments, read and participate in discussions about everything in life that keeps us moving.